One cover does it all! With a PTFE Snow Shield Cover, you will have the protection of the Rain Quake System which will also activate during a rain storm to keep water from sheeting on the reflective surface of the antenna. The Solar Cover system can also be added to keep the temperature within the cavity the same as the outside temperature to help reduce the movement of the reflective surface during day light hours. All three systems can be individually purchased or can be purchased all in one inclusive package to meet all of your Ka band environmental requirements. 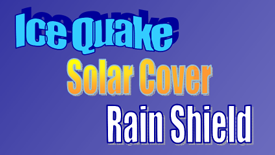 Hundreds of Ice Quake Systems have been sold since being released into our product line in 2009. Watch an Ice Quake system Shed Snow in A Minute!